Mikhail Baryshnikov is considered one of the greatest male ballet dancers of all time. With his incredible ballet expertise it made perfect sense for Baryshnikov to create his own line of ballet footwear. 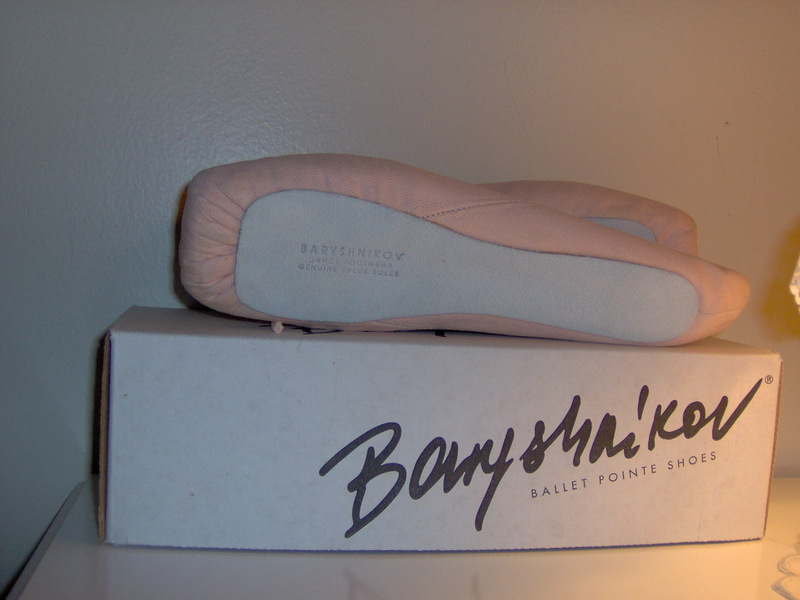 The Baryshnikov pointe shoe brand was on the market for only a few years and became a discontinued brand in the late 1990’s. 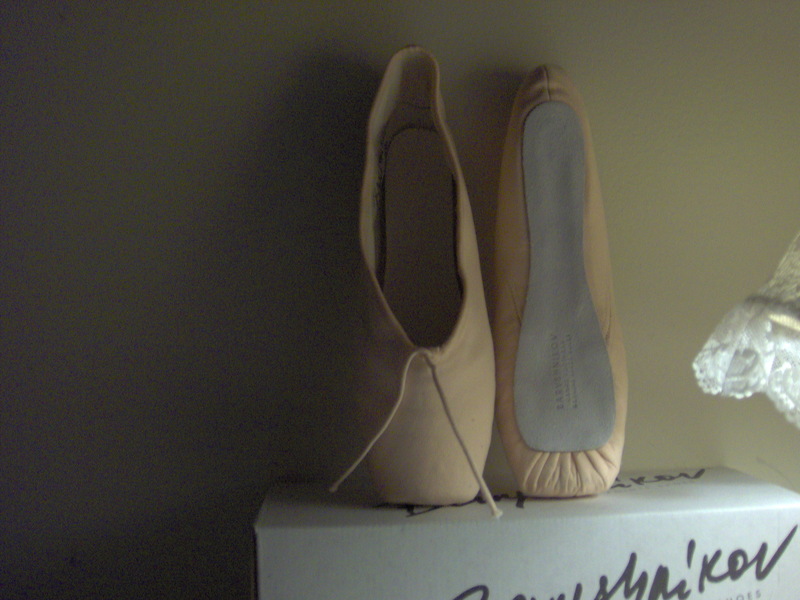 Pointe shoes with such a legend behind them can only become one thing; prized collectibles. I was pretty certain that whatever pairs of Baryshnikov pointe shoes that were left after being discontinued had been snatched up quickly or hoarded. 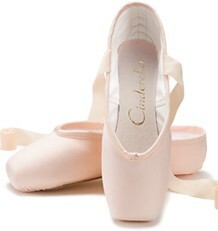 As a pointe shoe collector, I had put a pair of Baryshnikov’s on the top of my wish list. I searched all over the internet for a pair for a few months last winter and had all but given up hope of ever finding some for sale. In November, guess what? 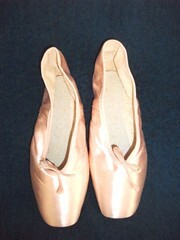 I found some Baryshnikov pointe shoes for sale, bought them, and will share my personal photos with you. It’s amazing to find these legendary shoes after being discontinued for more than 12 years! The side seams were sewn at an angle. I’m not certain why this feature was added. My guess would be for better shaping and contour along the arch of the foot. 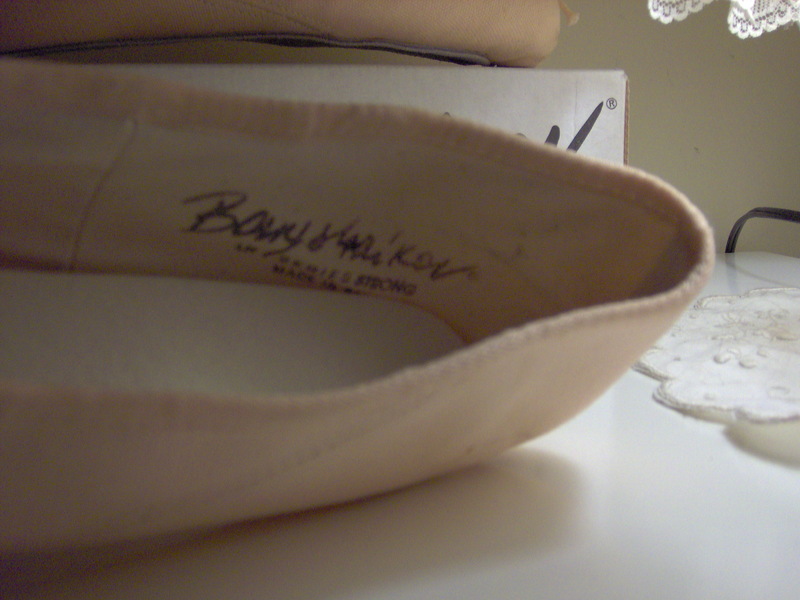 The most interesting thing about the Baryshnikov pointe shoe to me is that they were produced in the United States. 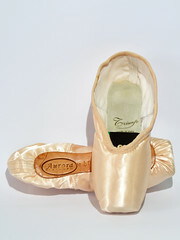 The inside of the shoe is stamped Baryshnikov, LR SERIES STRONG, Made In USA. 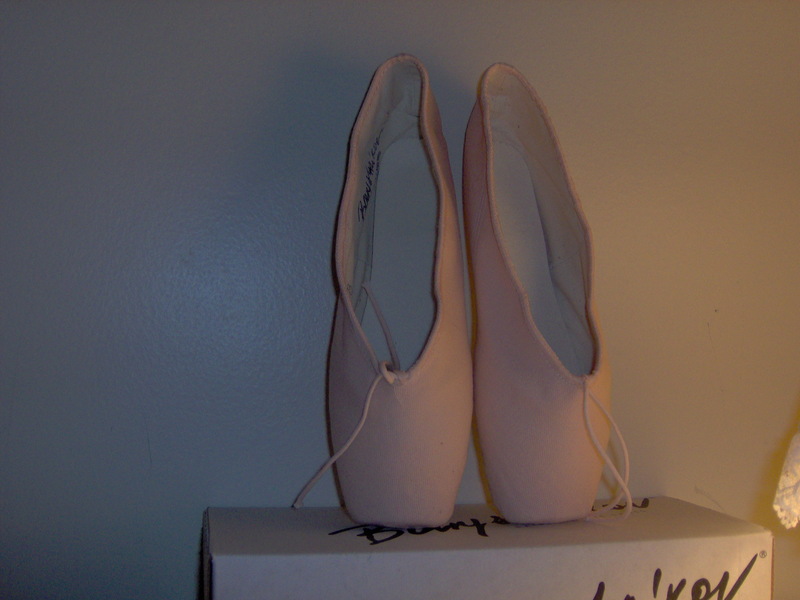 I really treasure these beautiful shoes; they are a wonderful part of the Baryshnikov legacy. This entry was posted in Discontinued Pointe Shoes and tagged Baryshnikov pointe shoes, discontinued pointe shoe brands, Mikhail Baryshnikov. Bookmark the permalink. 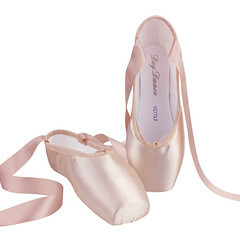 I remember fellow dancers wearing these in the mid-late 1990s, but not in canvas. My understanding was that the satin ones were not matte to work better for professionals, saving them a step in having to ‘pancake’ their shoes before a performance. They really are beautiful. 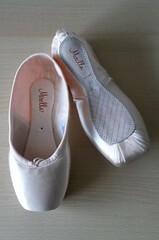 Hello,I bought my Baryshnikov`s [canvas] recently from Lynch`s dancewear shop in Michigan. I found them on Ebay US. Do you plan on dancing in them, or will you be saving them ? Hi.I am nearly 45 and was a dancer at the Moulin Rouge in Paris many moons ago.! I just collect different brands from all over the world now.I like ,where possible,new and unused pairs,so i can sell them on again one day[or my son can after I have popped my clogs.!!! I have a pair of new size 7c if you are interested. I have a pair of these shoes in size 4E. I don’t know which model they are! I have a new pair of these shoes in a size 7c if someone is interested in them. They are the pink canvas. Was going to put them on ebay but if you know someone contact me. Hi! I have a few brand new Baryshnikov pairs in canvas I hoarded, sizes 3 thru 4. If anybody’s interested, please email with your offer. Valerie Toa, I would love to see if you have some in my size, but your email address is not visible! Hi I love these I own 3 pair (2 are for dancing) if anyone has a size 5.5 I would love to trade my size 7 (brand new in plastic) or purchase from you my feet prefer dancing in vintage shoes. 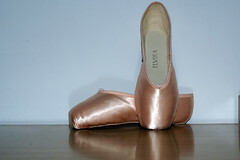 I had a pair of these when I was a young dancer and I loved them. 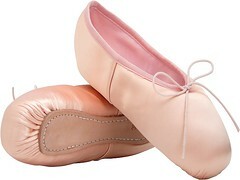 But even better than the pointe shoes were the split-sole canvas slippers. I loved the way they were constructed! !